Der Spiegel Magazine readers and German historians were sarcastically asking this past August how the very existence of a daughter of Alfred Krupp could be so easily erased without anyone taking notice. It wasn’t the story in der Spiegel that painted a much clearer picture of Alfred Krupp’s lack of character; it was the story in November in der Westen Newspaper. The newspaper outed a family secret only revealed 10 years ago- that a Krupp historian, Professor Burkhart Beyer, presumably scouring through the dynasty archives, discovered a young boy Krupp had fathered, and abandoned. Professor Beyer-who I agreed not to quote, and I will not-is a staunch Krupp supporter. Professor Beyer’s research revealed that Krupp fathered the lad when Alfred was seventeen years of age, and that his family (mother) hid this, “delicate,” matter from the world. This is difficult to believe since in 1927, when this boy was said to have been born, Alfred Krupp was a nobody, a struggling boy himself earning barely enough to pay the few workers he employed and help feed his mother and siblings. Yet der Westen reporter Dirk Hautkapp tells us that Krupp bought the silence of the poor pheasant mother with an amount comparable to what he paid one of his workers over a three-year period. Really? Why the need for such secrecy for a seventeen-year-old? For a family that went completely broke losing millions on a husband’s unfortunate business relationships with associates who claimed to be steelmaking experts, why wasn’t the loss of the family fortune veiled in the same secrecy as the family went to hide Alfred Krupp’s illegitimate child? It makes little sense. This steel curtain of secrecy would be better believed if it were for an older, wealthier Alfred Krupp about the age of fifty who clearly had his marriage and stake in his multi-billion Mark firm at risk. For my German readers please forgive my level of investigative reporting, but sometimes it becomes necessary to look at things not just from every angle, but from the inside out as well. Hautkapp should have establish the fact that Engelbertha was raised in the collective memory of Essen’s city dwellers. He has not done so for his full page feature newspaper story-a rarity he tells me-on the findings of my book, The Cannon King’s Daughter. I have yet to see a photograph of Engelberth’s brother, Friedrich, out in public with his parents Alfred and Bertha Krupp. Maybe Engelbertha was seen on many ocassions in Essen out with her mother but never reported in newspapers. I have counted on only one hand photographs of son Friedrich with parents Alfred and Bertha. I simply believe no more exist because Engelbertha appeared in the majority of them. Hautkapp then reports there was an illegitimate son fathered by Alfred Krupp that he kept secret for 175 years from the very same collective memory of Essen and its people. How is THAT possible? How did Krupp have the power to do THAT? Why did the church where Lobbert was born feel obligated to go along with Alfred Krupp and erase Alfred Krupp’s name as Lobbert’s legal birth father? We see similarities to the actions of the church (whatever its name) where Lobbert was born to that of the Market Church in Essen where Engelbertha was born. The fact is that Alfred Krupp absolutely, unquestionably and undeniably had the power to erase his name on Wilhelm Lobbert’s church record just like he had the same power to erase his own daughter’s church records. Case closed. Perhaps Essen’s Krupp Foundation and it’s scholarly machine would like to think and believe for you, the citizens of Germany, instead of giving you the opportunity to question the facts. One thing is for sure. The Krupp Foundation, Et. Al, has avoided all questions on the topic of Engelbertha Krupp like the plauge. They avoid it because there is too much evidence that points to the banishment of my great-grandmother and the legal problems they, “think,” could result. In reality, nothing of the sort could, or would happen. Why be part of the problem when you be be part of the solution? Alfred Krupp had his daughter’s name erased from the baptismal book at Market Church. In the minds of Germans, the Krupp Foundation will forever be viewed as an accomplice to Alfred Krupp’s actions so long as they continue to live in denial regarding Engelbertha Krupp’s banishment and the destruction of her church records. Are you an ancestor to Bertha Eichhoff Krupp? I am seeking to partner with German historians and/or scholars regarding information on the life of Wilhelm Alfried Lobbert, the unrecorded and illegitimate son of Alfred Krupp of Essen, North Rhine-Westphalia, Germany. Seeking specific, source-verifiable information regarding the birth, life and emmigration of Lobbert from Germany to the United States. Q- How could a banishment in the Krupp dynasty be hidden for 137 years? A- How could Alfred Krupp hide an illigitimate child for 175 years? 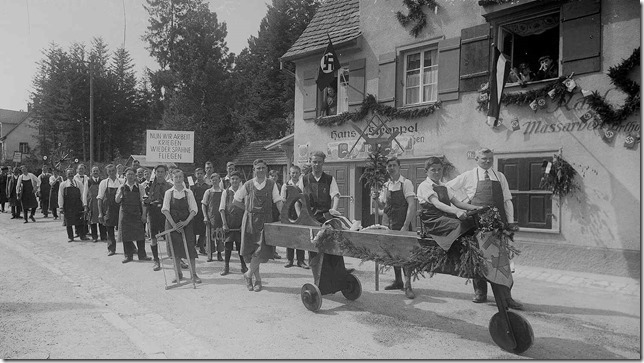 Leopold Street in Sigmaringen, Baden-Wurttemberg c. 1930. The street where my great-grandparents lived from 1875-83. The older man in the front in the right is believed to be Eugene Kromer, John Stroebele’s nephew. Photo courtesy Armin Schmid. Citing no sources, Tila Tequila claims Adolf Hitler a misunderstood and innocent man.